Synopsis: Playlogic has created Fairytale Fights using the Unreal Engine 3 to put players in the well known fairytale environments to spill blood as the characters most of us grew up reading about in a quest to bring peace back to their land. 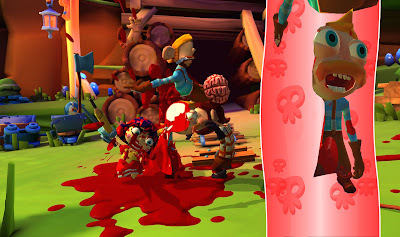 Fairytale fights is a platformer with gallons of bloodshed caused by hack and slash action handed out to the fairytale inhabitants by Little Red Riding Hood, Snow White, Jack & The Beanstalk, and The Naked King to regain the fame they once had. The action moves are brought to us by Playlogic’s “dynamic slicing technology” and a plethora (140+) of weapons at your disposal to bludgeon, slice, shoot, freeze, burn, or melt with acid. Praise: Fairytale Fights has a new unique style that is very colorful and happy looking, with a sick and dark premise, a good thing in my book. The environments are massive and took me back to the fairytale stories I had grown up on along with many of the same characters in them. There is no shortage of weapons in this game, so if you die and lose your weapon, you can just take one from the next enemy you bludgeon or decapitate. Coop is where I got the most enjoyment from this title as you can play with up to three other players to help progress through the story. 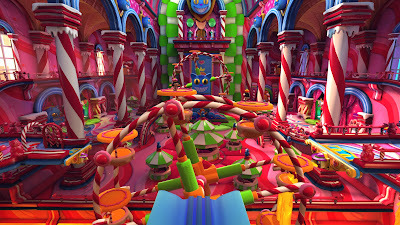 Gripes: The controls are not as friendly as what you would see in other hack and slash titles, as attacks are controlled by flicking the right stick in different directions. When you kill an enemy, there blood covers the ground and when the character walks over the blood covered ground, you tend to slip and lack control of movement, which could result in death if you slide off edges or into the environmental hazards. On the topic of deaths, you are not penalized when you die, so there is no game over to get when you repeatedly lose lives, which can be good for those not looking for a challenge, but I was not a fan of it. Overall, Fairytale Fights is an entertaining break from the norm, which is filled with racers and first person shooters, but did tend to lose some of its novelty throughout the story. 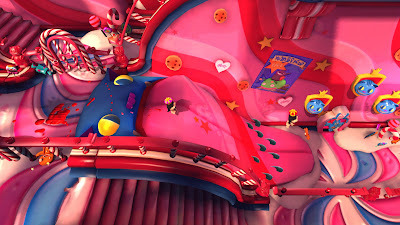 The artwork in the environments are reminiscent to a Happy Tree Friends or Itchy & Scrathy episode, while the gameplay provided by the Unreal Engine make the game beautiful and flow smoothly without any noticeable bugs while playing through the story alone and cooperatively in online interactions. If you are fan of the platformer genre, it would be a good idea to give it a shot, and if purchased within 90 days, owners will also receive soon to be released DLC at no charge, which I understand to include new playable characters and maps. Mashbuttons.com gives Fairytale Fights a 7 out of 10. 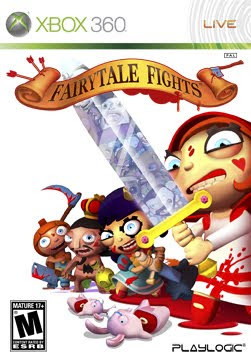 Fairytale Fights is available now for the Playstation 3 and Xbox 360.